If you live in an inner city, or suburban area in the UK, the chances are that you are in a Smokeless Zone. This doesn’t mean that you can’t own, or use a wood burning stove, or even that you can’t have smoke coming out of your chimney, but rather that you should adhere to a few basic requirements in law. 3. Be picky about your fuel! There are few advantages (If any!) in burning poor quality wood fuel. You may burn Approved Smokeless Fuels as well. There are many appliances you can choose from to stay on the right side of the law. Some are illustrated on this page. They are based on several mechanical systems but basically all intended to raise flue gas temperatures high enough to ignite smoke as it is released from the fuel. Inevitably though, we are discussing some very efficient appliances, so the chances are that we and any other responsible retailer will want to inspect and judge your chimney before supplying an appliance of this type, as they can be VERY temperamental. To see more examples call in at the showroom. You can enjoy the warmth and hypnotic flames, with efficiencies so high that smoke emissions are five times less than a conventional stove. Clearview stoves are renowned for their simplicity and reliability without the need for a catalytic converter which is reported to reduce efficiency over a few years of use. 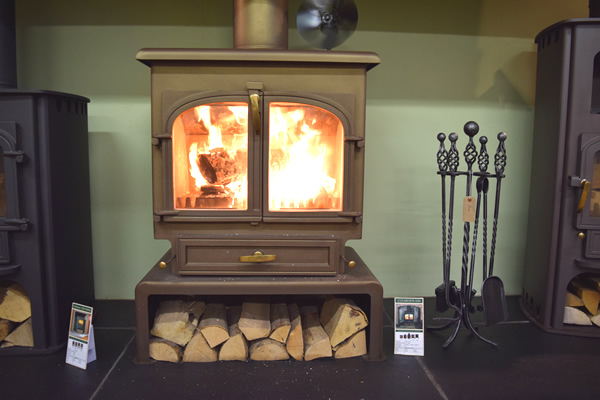 Clearview stoves are designed for and by people who want clean burning, high efficiency, combined with the finest craftsmanship and traditional styling. Stovax are another distributor, rapidly “Approving” appliances. Again, not inexpensive, but some great stuff. Continental and Scandinavian suppliers are generally slow and sometimes downright hostile to UK smoke control legislation. Understandably. Often they have built appliances for their own, vast, home market, to exacting European emission standards. The UK is somewhat out on its own on this in that we apply a unique test, and charge manufacturers per appliance configuration for inclusion. Its all a bit of a minefield but we can guide you through it! Call us or visit our showroom to discuss your smoke control stove needs or contact us using the form here on the website.